From working the overnight shift at a Newtown petrol station, acting as an extra in Lord of the Rings, to representing worldwide human rights agencies at the United Nations, Victoria University alumnus Bruce Adamson has had a varied career. But he says those experiences—and everything he’s done in between—have been rewarding and will all help him in his next job as Scotland’s Children’s Commissioner. Bruce says those overnight shifts also provided some interesting opportunities for discussions with various customers that would prove useful for his future career. He says volunteering at the Community Law Centre while he was studying also helped him make the connection between what he was learning at law school and the lived experience of people going through challenging times. It also ignited a passion for family law—one that continues to this day. He says the thing that brought him to Scotland were all the clichés: “Bagpipes, Braveheart, Billy Connelly, whisky, kilts and castles.” He arrived at a time of significant constitutional change in the late 1990s, when Scotland voted for devolution from the Parliament of Great Britain, which it had been part of for the previous 300 years. He became a foundation staff member of the office of the Children’s Commissioner when the Scottish Parliament established it in 2005. A few years after that Bruce helped Parliament set up the Scottish Human Rights Commission, where he has remained as a legal officer until this year. In 2013 Bruce was seconded to Geneva to represent the Global Alliance of National Human Rights Institutions. “The workload was unbelievable but it was a huge privilege to represent institutions from over 100 countries. All that Socratic method from Victoria’s Law School really came in handy when I was negotiating resolutions and arguing for treaty recommendations,” he says. 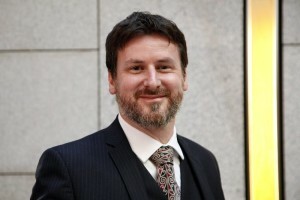 In March this year, after a rigorous four-month recruitment process, the Scottish Parliament announced its decision to appoint Bruce as the country’s new Children’s Commissioner. He says both Scotland and New Zealand are doing well in terms of the rights of children, but could learn a thing or two from each other.